Sometimes I create a piece of pottery that seems destined to find a home with one of my special friends. Recently, two pieces ended up in their perfect place. 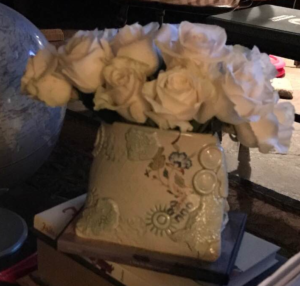 The first piece is a vase with many stamped details and additional textured pieces added on. It was given a colored wash before being clear glazed. Then, decals were added and the piece was fired again. I’m thrilled that this ended up in the home of a dear friend. It fits her eclectic style perfectly. 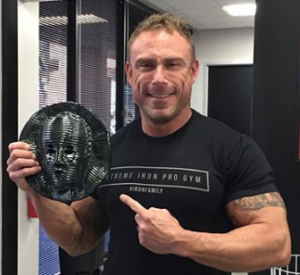 The other piece is a wall mask that just seemed to “belong” to my trainer. It suits him and he’s already hung it in his home. My closet is overflowing with pieces. Hopefully all of them will find their way to their perfect homes. Oh my, Charlie … what a mix! 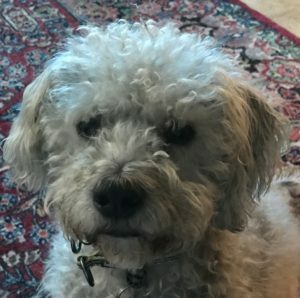 A few years ago, we adopted a small two-year-old poodle-mix dog from a city shelter near San Antonio. He had curly hair like a poodle and a curly tail. But, his nose and his chest were broad. We thought he might be part Schnauzer because he seemed a bit headstrong. We attributed quirks to his being a “street dog” for most of his life and having to protect himself from dangers seen and unseen. He settled down quite a bit after he was neutered and went to a month of boot camp. Then, I learned about a DNA kit for dogs. Hmmmmm … it would be nice to know exactly what breed(s) are in Charlie. So, I ordered the kit and, when it came, took a cheek swab and sent the kit off to be analyzed. Well … the results are in! And guess what!! 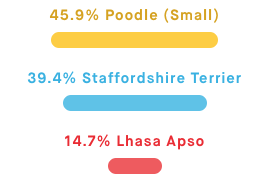 Charlie is mostly poodle but he’s also American Staffordshire Terrier and Lhasa Apso. His genetics make-up estimates his age to be 42 (human) years and his adult weight to be 28 pounds. Last time he was weighed, he was 26 pounds. The good part is that he is not at risk for any canine genetic diseases or defects. Just realized that it’s been more than a year since this blog/website has been updated. I’m mortified but realize that time keeps plodding along and, if I don’t actually sit down and post something, the elves won’t do it for me. Started taking pottery classes at Brookhaven College. Love the fact that they have cone 10 firings in reduction, soda and wood. And there’s also a raku kiln. The teacher and students inspire me. Late October 2016, broke my right wrist again and was in a cast for approximately six weeks. Darn … that slowed me down a little. My granddaughter had her first child in February. A boy who looks a lot like his father. Installed new landscaping around the house but a hot summer wreaked havoc on some of them. They just couldn’t take the heat. So much more happened but these are the highlights. Hope to post some pictures in the next few days.